Silktide Prospect has the ability to carry out a wide range of tests when analyzing a website. By default, only a core number of tests are enabled but it is possible to enable additional tests, or disable tests that you do not want. Whilst you could enable every test available within your report, it is worth considering how the increased level of information will come across to your clients when you share or discuss their report with them. The phrase “less is more” is certainly worth keeping in mind here! Only account administrators have the ability to adjust the tests carried. In here, you can enable or disable tests by toggling the switch next to the test name. As you can see in the example above, accelerated mobile pages, AdWords, alternative text, amount of content, analytics and backlinks is disabled in this account, whereas broken links, code quality and contact details are. Once you have enabled or disabled tests, scroll to the very bottom and hit “Save” to apply the changes. You may want to review the “Overview layout editor” to ensure that all the tests are displayed on the overview screen, as newly enabled tests are not shown by default. Please note, the new test settings will only apply to new reports generated after you have applied the changes. If you need to include the new test settings on an existing report, you will need to retest the report (a report credit will be used). It is also possible to adjust how much influence each particular test has on the overall score by changing the weighting applied to each test. 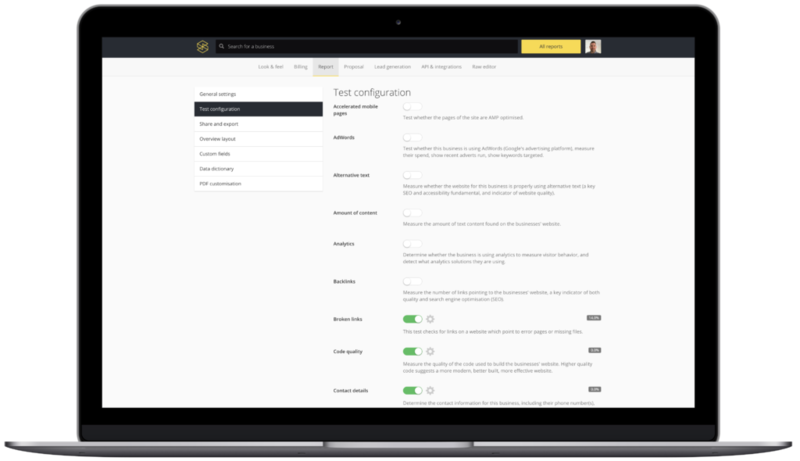 We set the default values for each test based on our experience of industry standards, but if you need to adjust the weighting behind the tests then you can do just that. To adjust the test weightings, follow the same steps as above to access the “Report” settings page. You may have noticed a small cog next to each test toggle, if you click this you will see additional options (where applicable) and a slider that has a value between 0 and 100. Please keep in mind that the weighting each test contributes to the overall score are relative to each other – for example, if you enabled two tests, mobile optimized and Facebook page detection, and applied a 100% weighting to both tests, you would expect a website to score 100/100 if they pass both tests, 50/100 if they fail one, or 0/100 if they fail both. Likewise, if you enabled an additional third test, Twitter detection, and set the weighting to 100% also, the website would score 100/100 if the pass all three; 66/100 if they pass two; 33/100 if they pass one and finally 0/100 if the fail all three.